Have you ever wondered what it would be like to walk on walls and ceilings? Defying gravity as we know it and experiencing the world from a new perspective? Etherborn makes this idea the core concept of the game, along with plenty of puzzle solving. The MC Esher-esqe feeling of the levels combined with the peaceful gameplay make for a fantastic time in this platformer. Etherborn is a 3D platformer with a focus on gravity-based, perspective altering puzzles. Unlike other games with puzzles about matching symbols, discovering codes, and the like, this game relies on you maneuvering around in order to discover new paths. Sometimes you just need to use slopes in order to move from one surface to the next, other times you might need to jump gaps, and you may also need to power mechanisms with white grid-like gems. These gems are placed throughout the levels and you can pick them up for later use once you’ve reached them. Conveniently, after you’ve placed a gem into a mechanism, you can take it back out after you’re done with it (if the situation calls for it). The gems trail behind you, so you can collect as many as you want at a time, which is extremely helpful. Some mechanisms that you’ll encounter move platforms, remove hazards, and much more. 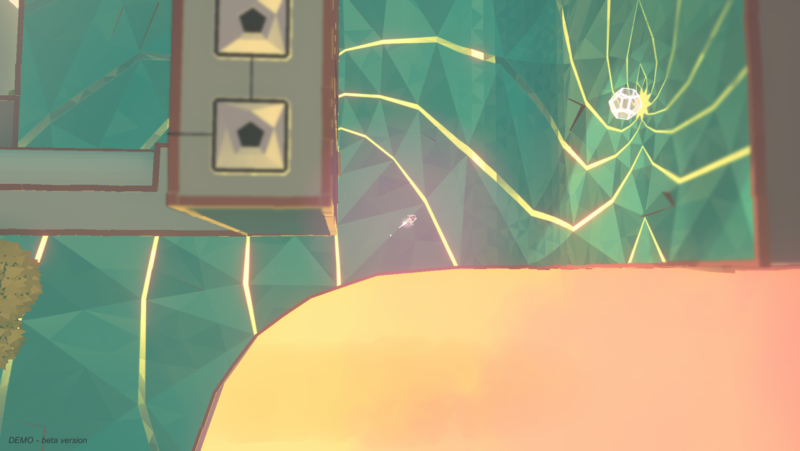 As mentioned earlier, gravity changing and walking on walls and ceilings is a core aspect of the game. There’s no button or anything that causes this; you must find sloped surfaces and walk along them. This means that walls and ceilings are only relative, which is incredibly fascinating gameplay. One second you could be walking along a platform, and the next you could be moving up the side of a giant tree branch. Don’t worry, even though I use the word walking constantly, you can “run” as well. I use quotations because it feels more like a brisk jog, which fits perfectly for the feel of the game. The game is as much about soaking in the gorgeous environment as it is the puzzle-solving, so it’s better to not rush through it. Etherborn is an incredibly relaxing, casual game. That doesn’t mean that you can’t die though. 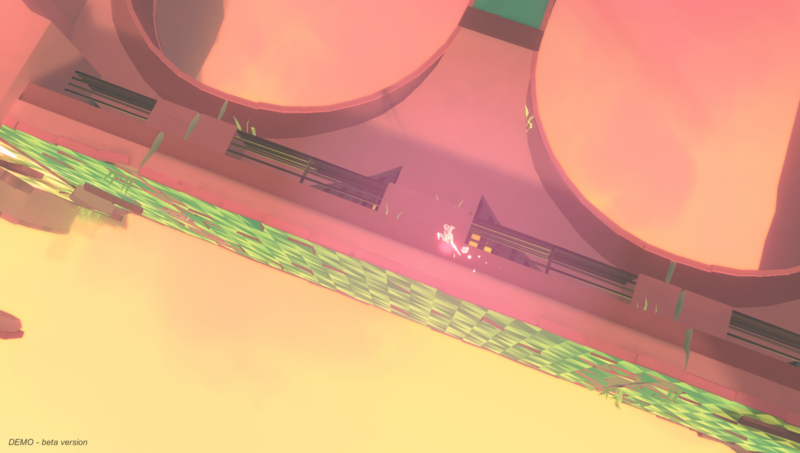 If you mess up a jump or walk off the edge, you’ll fall into the abyss. There are also some hazards that can kill you if you touch them. Not to waste time, you instantly respawn back on the surface you fell from or at least somewhere close. This means no loading times from death and I love that. It allows you to get right back into the game and keeps you immersed. The level design of the game is amazing and the visuals are stunning. Each level is beautifully crafted and begs to be explored. You need to explore in order to progress, but you’ll also want to explore just to see what the level has to offer. Everything from tree branches to waterfalls to ruins and more give off an air of peace and tranquility. The color palette was perfectly chosen to match that atmosphere. The soothing ambient music and sounds add an extra layer that puts you more at ease. The point it, it’s clear how much time and effort was put into creating their vision. As for story, it’s on the vague and philosophical end so far. You are a faceless humanoid being that is following a disembodied voice. The voice speaks of humanity’s history and philosophy, which inspires you to continue forward and potentially reach the source of the voice. There are only three levels in the demo that I played, so I didn’t get much in terms of story, but I’m hoping that more will come to light in the full game. When the demo ended, I was bummed that my time in that fantastical world was over. As of now, the release date is set for Spring 2019. Hopefully it releases sooner rather than later, as it will give me the opportunity to continue my journey and discover the meaning behind it.